Between 1980 and 2000, Colorado lost 1.5 million acres of ranchland. The 1960s per-acre price went from “less than $200” to thousands per acre. Land doesn’t spontaneously increase in value but is a function of calculated inflation (the hidden tax) – driven by sudden surpluses of Federal Reserve Notes that decrease the value of currency already in circulation while escalating all prices. Evidenced by the acreage figures cited in part one of this multi-part article, the Pentagon does not “need” more land. The army’s proposed expansion would give them a total of 2, 577,304 acres (thousand square miles), just at the Piñon Canyon Manuever Site, as shown on the map or this map. The army’s Colorado land grab, a scheme to cleanse the area, is merely the tip of the globalist iceberg which concerns, not only ranchers, but the entire middle class. The army, literally acting against American citizens, is not alone but merely the first offense – the patriotism ploy! Others are involved – smug, obedient bureaucrats, environmentalists and tax-exempt foundations. Price fixing and profit manipulation, as John D. Rockefeller discovered, was best achieved by refining and selling oil rather than extracting it from the ground. Skilled carpenters, factory workers, ranchers, farmers, and meatpacking workers labor for decreasing returns while monopoly capitalists, comfortable in luxurious boardrooms, control markets to enhance their personal fortunes without loyalties or consideration for America’s citizens or general economy. Consider construction – individuals cut lumber, assemble fixtures, pour cement, install a roof, paint and together build a house. Who benefits the most? Not the producers – rather the fractional-reserve banker who extorts usury on a paper-only loan. Congressional leaders, financial benefactors of corporatism, broke up the Chicago-based beef trust (Armour, Cudahy, Morris, Swift and Wilson) through the Packers and Stockyards Act of 1921 – an example of Hegelian Dialectics. Create a crisis and then fix it with pre-determined government regulations that typically only burdens small business firms. Reasonable competition existed until Reagan’s Administration. Public Relations firms produced “facts,” opinion pieces, expert analyses, and managed public polls, telephone solicitation, direct mail, and created “citizen” advocacy groups and “public-image-building campaigns for their corporate clients. One firm, Burson Marsteller, enjoyed net billings in 1992 of $204 million. “The top fifty public relations firms billed over $1.7 billion in 1991.” Public relations employees, who outnumber news reporters, manipulate the news “to serve the interests of paying clients.” By 1990, almost 40 percent of the news originated from public-relations press releases. Public Relations firms continue to influence public opinion according to who purchases their unique services. 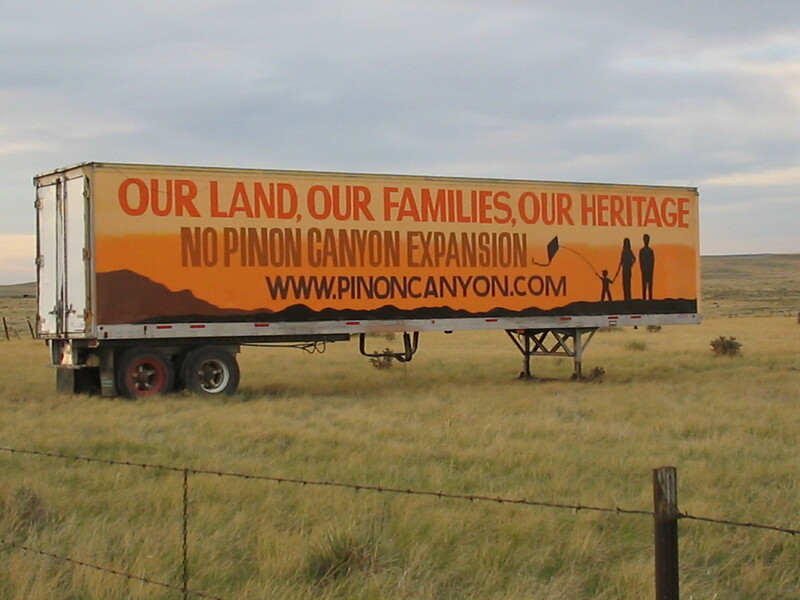 Booz, Allen, & Hamilton, Inc. (hereafter Booz Allen), a public relations firm has been paid $500,000 a year for their Piñon Canyon “expansion planning” including managing invitation- only meetings with southern Colorado residents. Booz Allen, headquartered in McLean, Virginia, has clients such as the Air Force, Federal Transit Administration, Labor Department, the Navy and the U.S. Agency for International Development. Ex-CIA director and Rhodes Scholar, James Woolsey, became Vice President of Booz Allen on July 15th, 2002.”  He served as counsel for major corporations in both commercial arbitrations and the negotiation of joint ventures and other agreements. Woolsey is one of the signers of the January 26, 1998 Project for the New American Century (PNAC) letter to Clinton urging military action against Iraq. Dov S. Zakheim (CFR), Pentagon Comptroller from May 4, 2001 to March 10, 2004 also became a vice president at Booz Allen on May 6, 2004. This was after he was unable to track $1 trillion dollars at the Pentagon (in addition to the $2.3 trillion on September 10, 2001). PNAC, promoters of American imperialism and “Full-spectrum” dominance, is funded by the Sarah Scaife Foundation, the John M. Olin Foundation and the Bradley Foundation.